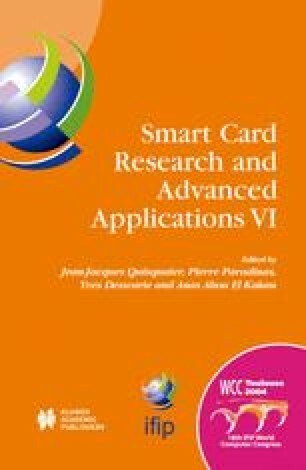 Considering the typical amount of memory available on a smart card, it is essential to minimize the size of the runtime environment to leave as much memory as possible to applications. This paper shows that on-the-fly constant pool packing can result in a significant reduction of the memory footprint of an embedded Java runtime environment. We first present Jits, an architecture dedicated to building fully-customized Java runtime environments for smart cards. We then detail the optimizations we have implemented in the class loading mechanism of Jits to reduce the size of the loaded class constant pool. By suppressing constant pool entries as they become unnecessary during the class loading process, we manage to compact constant pools of loaded classes to less than 8% of their initial size. We then present the results of our mechanism in term of constant pool and class size reductions, and conclude by suggesting some more aggressive optimizations. This work is partially supported by grants from the CPER Nord-Pas-de-Calais TACT LOMC C21, the French Ministry of Education and Research (ACI Sécurité Informatique SPOPS), and Gemplus Research Labs. Schwabe, J. E. and Susser, J. B. (2003). Token-Based Linking. US Patent Application number US 2003/0028686 A1. http://www.uspto.gov/. Sun Microsystems (2000). J2ME Building Blocks for Mobile Devices. http://java.sun.com/products/kvm/wp/KVMwp.pdf. Sun Microsystems (2002). The CLDC Hotspot Implementation Virtual Machine. http://java.sun.com/products/cldc/wp/CLDC_HI_WhitePaper.pdf. The J-Consortium (2002). JEFF Draft Specification http://www.j-consortium.org/jeffwg/index.shtml.